The purpose of hardware independent imaging software is to allow system administrators of multiple computers to create a single system image that can then be deployed multiple machines easily. It will save your much time that you don’t need to backup system manually one by one, or configure alarge number of new clients. AOMEI Backupper Professional is a free kind of Hardware Independent Imaging Software, it cannot only help you to create hardware independent system Image, but also, offer partiton, disk and file backup and clone functions. System bakcup will help you to create hardware independent imaging windows PC system. besides that, you can backup disk, partition and file. Universal Restore will help you to restore system to other machines, and that’s important steps to use hardware independent system Image. System clone can migrate your system to other HDD or SSD to help you upgate hardware easily and safely. Disk clone and partition clone will be useful as well. There are a lot of tools to help you maintain system and backup. AOMEI PXE Boot Tool will help you boot multiple clients from one server, etc. Tips: For more useful and advanced features, please click on here. AOMEI Backupper Professional edition support to create hardware independent system image freely for Windows PC system, If above functions can’t meet your demands, you can buy AOMEI Backupper Technician. If your computer is Windows Server system, you can consider to buy AOMEI Backupper Technician Plus. Step1. Download and install AOMEI Backupper, and use AOMEI Backupper to create a full backup of system. 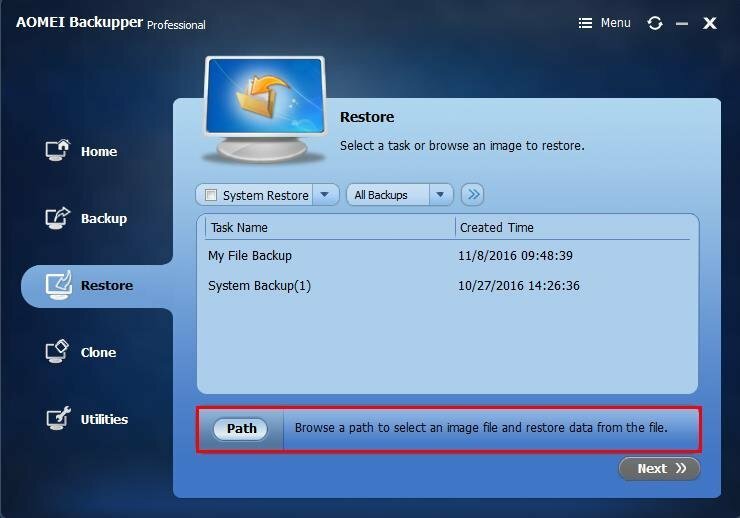 Install AOMEI Backupper in other clients, and select “Restore”, and then choose “Path” to add system image. Step2. Select backup time point. If you don’t want to cover the current system of computer, you can tick “Restore system to other location”. 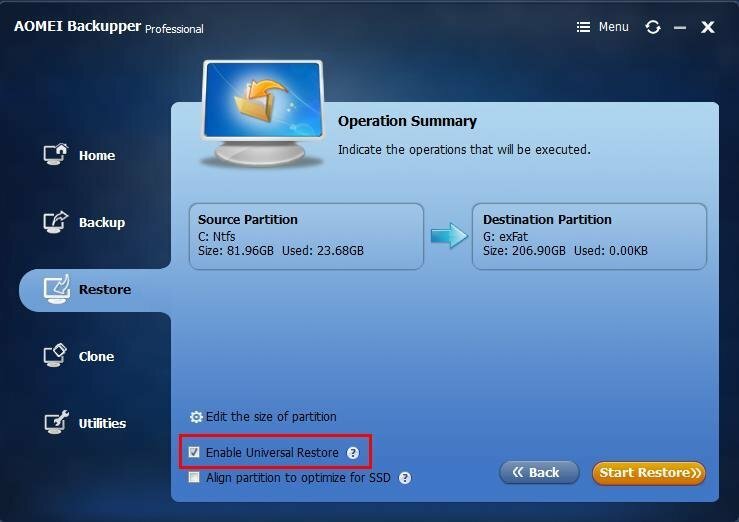 Then, click on “Next” to choose other partition as destination. If you don’t tick, just skip it and click on ”Next”. Step3. Verify restore location. Due to dissimilar hardwares, you must tick “Enable Universal Restore”, system backup image will be restored to other machines successfully. Finally. Click on “Start Restore” to process. Because hardware environment of every computer are different. Some drivers such as sound card, net card and so forth can’t be compatible with other machines after they are restored. You need to reinstall some drivers after using hardware independent imaging software. Is there shortcut to enter recovery enviroment quickly? 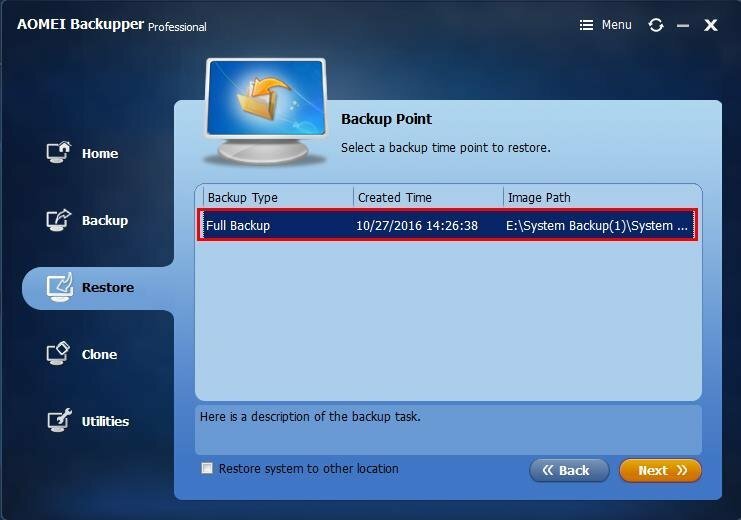 Need application in backup image be registered after be restored in different machines? Yes. In rationale, the running environment has been changed, and some applications need to be registered after using universal restore.